SAMHEUNG PAPER BOARD CO., LTD. The Sports Seoul Co., Ltd.
South Korean pulp, paper and paperboard market grows 33% over 2007-2012, reaching Won12.4 trillion in the latter year. Paper and paperboard form by far best-selling category, capturing 81% of sales at end of the review period. The value of imports expands 29% over the review period, comprising 28% of market size in 2012. The value of local production rises 42% over 2007-2012, to reach Won10.1 trillion at end of the review period. Profits rise 39% over the review period to Won1.1 trillion in 2012, profitability totals 11% at end of the review period. Total costs grow 42% over 2007-2012, 91% of total costs comprised of B2B costs in 2012. The value of exports expands 59% over the review period, comprising 23% of product output in 2012. Industry’s turnover expected to grow 40% over 2013-2018 forecast period. 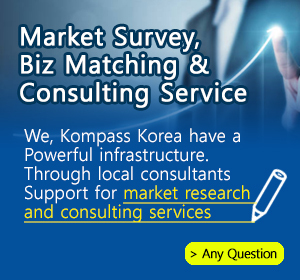 With over 1,100 South Korean companies registered in the Kompass B2B worldwide database, the Paper, Printing, Publishing sector represents medium activity sectors within our database. This family includes carboard, printing, office and shop eqiupmet, etc.